Batchelor and Bailey were arrested in June 1989 and charged with the murder of Lula Mae Woods, who was found stabbed to death in her garage. A Domino’s Pizza hat not belonging to anyone in the family was found near her body. Police began questioning a number of black young men in the neighborhood and Batchelor and Bailey, both 19 years old at the time with no criminal history, were subjected to lengthy interrogations in which they allege officers beat them physically until they falsely confessed. During the post-conviction process, DNA testing of a hat presumed to be worn by the murderer and bloody towel found near the body excluded the two men. Their confessions were inconsistent with each other and did not fit known details about the crime, but both were convicted and sentenced to long prison terms. Batchelor served 15 years for the murder and was paroled in 2004. Bailey was released upon exoneration, after serving 28 years. In 2014, after years of litigation, their cases came before the Illinois Torture and Relief Inquiry Commission, which was created in 2009 by the Illinois Legislature to investigate claims of torture by former Chicago Police Commander Jon Burge and officers under his supervision. In 2017, newly-appointed Special Prosecutor Robert Milan agreed to reinvestigate Batchelor and Bailey’s torture claims, and after reviewing the case for seven months, he agreed to join their motions to vacate the convictions. “Today is a great day; it’s a just day. 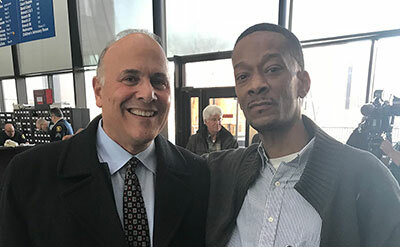 It’s a day that I thought I would never see,” Batchelor said outside the courthouse, with CWCY attorney Steven Drizin, a clinical professor of law, by his side. “I thank God, and the people that supported me, and my legal team that believed enough in me […] that’s what helped me to make it through,” Batchelor said.